A tool for drawing area proportional Euler diagrams. VennMaster is a tool for drawing area proportional Venn/Euler-diagrams. It supports several input formats from simple tab seperated data to gene lists from GoMiner. 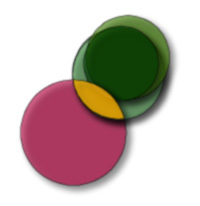 VennMaster will generate area proportional Venn diagrams for multiple sets. Since exact solutions seldomly exist for more than 3 sets, it will approximate a correct solution. VennMaster is great for assessing overlapping data at a glance, as well as for in depth analysis. Kestler, Hans A., et al. "Generalized Venn diagrams: a new method of visualizing complex genetic set relations." Bioinformatics 21.8 (2005): 1592-1595. Kestler, Hans, et al. "VennMaster: area-proportional Euler diagrams for functional GO analysis of microarrays." BMC bioinformatics 9.1 (2008): 67. Our paper "3D Network exploration and visualisation for lifespan data" has been accepted in BMC Bioinformatics.